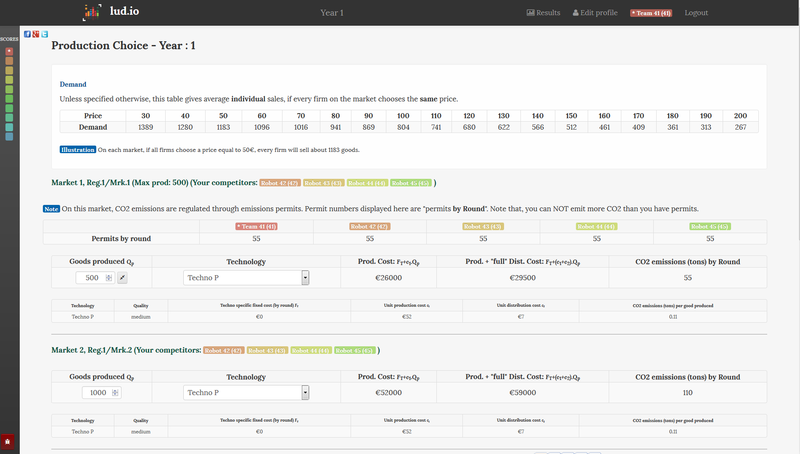 We are launching a new Inter-University Student Tournament, based on an Economics Game! (simulations close to those that are described here: https://lud.io). Last year, HEC Montréal won the tournament, Toulouse School of Economics was second and Cardiff Metropolitan University completed the podium (all finalists and ranking). Will you follow them? The qualification phase consists in playing a few years of a mono-player simulation, between now and November the 22nd, 2018 (vs robots behaving like humans did, in previous experiments). You can play when you want, at your own pace. The 12 best teams (and also, all those who get a score above 2 350 000 €) will be qualified for the finals (and scores will be reset). The finals will be played between November the 26th and December the 1st, 2018: Players will have to enter one decision every day, before 21h CET. Both phases are played online. The winning team will be awarded a voucher around 300€ as a first prize (on amazon or a similar site). Students can participate on their own, with no need for support from their instructors: The game will require some strategic thinking but there is no prerequisite in economics. This should be fun, so join the tournament! One team (2-4 players) from any university or school is welcome to participate. You can register on this page (deadline for registration: Monday, November the 19th. In some universities, registrations are directly managed by professors: If you are not sure, contact us and we will tell you). Teams (2 to 4 players) have priority over individual registrations until November the 1st. After that date, individual registrations are accepted.